Iron Man, based on the Marvel Comics superhero from the 1960s, opened Friday nationwide. Directed by Jon Favreau, it tells the story of Tony Stark (Robert Downey, Jr.), a less charitable Bill Gates-like (updated from Howard Hughes in the comic) multi-billionaire who makes most of his fortune from the lucrative weapons development division of his company. Injured when he is captured by rogue terrorists, he has a change of heart (literally and figuratively) about his role in the scheme of things, after seeing the terrorists using his weapons to subjugate the innocents of their country, and defeat American soldiers. 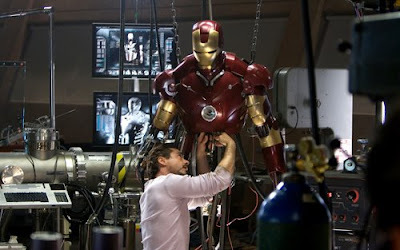 Forced to make a missile for them in return for his release, he instead makes the first clunky version of the armor that will lead to his new endeavor as Iron Man. The film is everything a fun summer flick should be. It's topical, updating the comic book origin to take place in Afghanistan rather than Vietnam. It's exciting, particularly whenever Stark takes exhilarating flight as he tests his armor. It has enough humor to let you know it doesn't take itself too seriously. One running gag involves a government agent frustratedly seeking a moment to debrief Stark after his escape from captivity. The gag is amusing on that level, but it's also a nod to the geeks (if they listen to what division he's from, they should get the joke right away). And it has a brilliant cast. Downey is perfect for the party boy savant Stark, whose lifestyle parallels much of Downey's own brushes with addiction. Gwyneth Paltrow, as his assistant Pepper Potts, is clearly having fun with her role, but is integral to saving the day, a role rarely assigned to females in this genre. Terrence Howard as Rhodey is the everyman that must manage his friend, making sure he doesn't screw up his naive pursuit of justice, but secretly happy that his friend has the guts to go outside of the box in his crusade. Jeff Bridges is a strong adversary. His Obadiah Stane is the real workhorse who's built Stark Enterprises to what it is today, and won't see it, or himself, flushed down with the refuse because the mercurial Stark has had a sudden notion to save the world. Bridges wisely plays the villain without twirling his mustache too much. Instead, he makes us understand the business obligations that drive Stane to do what he has to do, delineating the contrast between Stane's pragmatic persona with Stark's, until now, more flighty one. By the way, if you're a fan of the comic books, stay till after the end credits for a special surprise that sets up future adventures. You will not be disappointed. Iron Man is a solid entertaining way to start the summer movie season, and I hope the rest of this season lives up to the benchmark established by this film.